I downloaded free version of VeryPDF PCL Converter 2.7 to try to add a barcode to a document but the test file doesn't work. I work with windows 2010. Free 3 of 9 is not found but the fonts is present on the PC and it works on word. 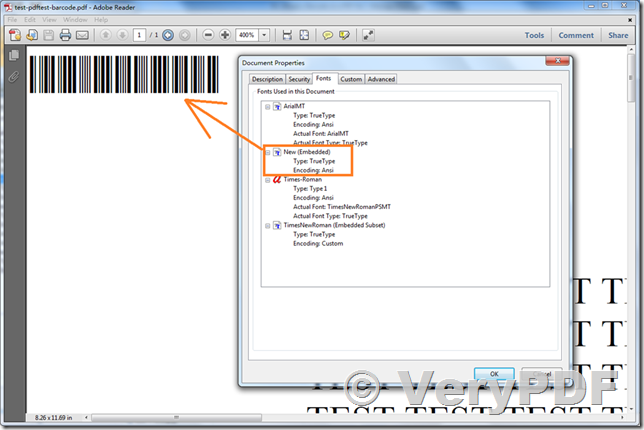 pdfstamp.exe -pdf pdftest.pdf -o pdftest-out.pdf -at 1234567890 -ft "Free 3 of 9"
How to monitor a folder and convert incoming PCL files to PDF files automatically? This entry was posted in PCL Converter, PDF Stamp and tagged PCL to PDF, pdf stamp, pdf stamper, stamp PDF. Bookmark the permalink.